Via The Economist, I’ve come across some fascinating research by Orley Ashenfelter and Stepan Jurajda (Comparing Real Wage Rates, 2012) showing how real wages can be meaningfully compared across different regions by taking notes on prices and wages in McDonald’s restaurants. The methodology seems solid. 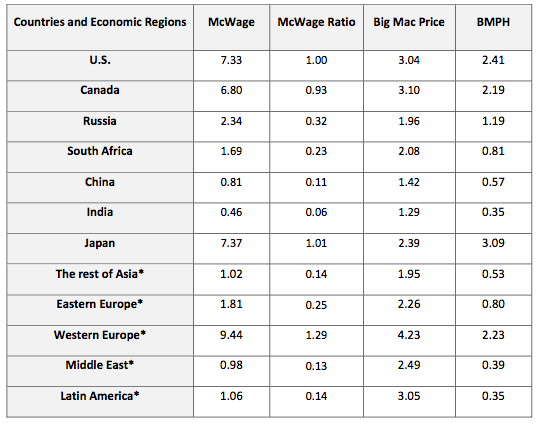 Big Macs are a very standardized product, hence they are already used in the so-called Big Mac Index to assess international price differences (and whether currencies are undervalued or overvalued) and REAL wage rates (prices tend to be lower in poorer countries, mitigating the effects of lower nominal wages). 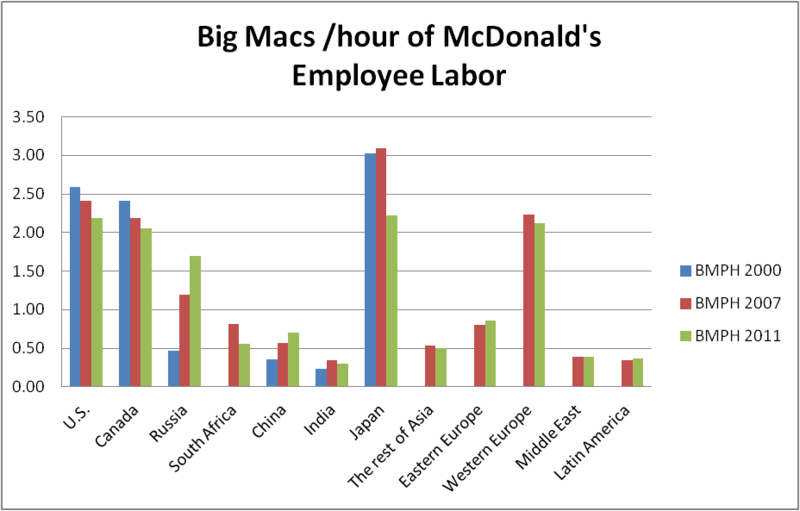 By combining these two measures, you can derive the quantity of Big Mac a McDonald’s worker can buy through one hour of his labor (BMPH). This in turn is a good proxy for real median wages, i.e. the life of the average Joe and Ivan in comparative perspective. While we might not want to people to buy too many Big Macs it’s a positive thing if they can actually afford to. The results for Russia are stunning, and no doubt go a very long way why Putin has retained 70% approval ratings since 2000. 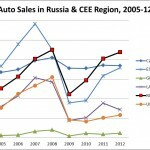 Russia’s BMPH increased by 152% (!) from 2000 to 2007, and a further 43% through to 2011, leaving all other economic regions in the dust, even despite a sharp recession in the latter period. The only major region with a comparable performance is China. In contrast, the BMPH has stagnated throughout the developed world since 2000; and Not So Shining India joined them from 2007. During the boom years of 2000-2007, real wages for lower-class workers appear to have risen sharply in Russia, China, and India; while stagnating or declining in Japan, the US, and Canada. Furthermore, the MBPH continued rising sharply in Russia throughout 2007-2011, despite a very deep recession; and to a lesser extent, in China and the rest of Eastern Europe. 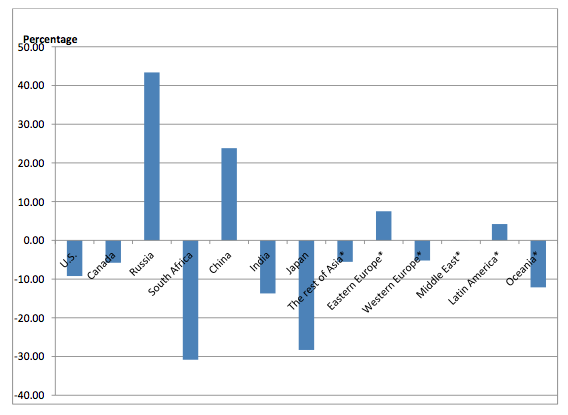 Two of the BRICS, India and South Africa, had very deep declines. 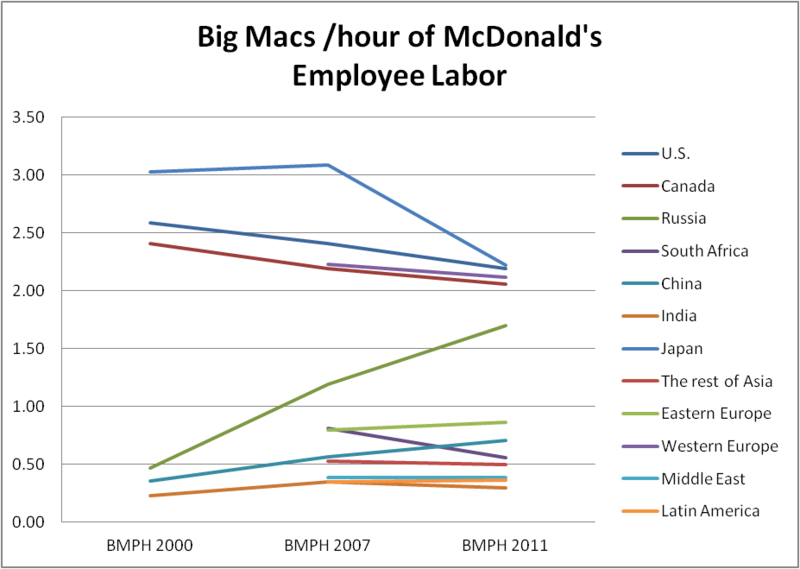 The result of this growth is that even by 2007, the Russian BMPH was already at about 50% of West European and American levels; while its wages were still much lower, this was mitigated by concurrently low prices for its Big Macs. Another noticeable thing is that the effects of higher West European minimum wages disappear as they are mitigated by higher Big Mac prices relative to the US. As a result real wage rates across the developed world seem to be remarkably similar, with Japan’s somewhat higher. 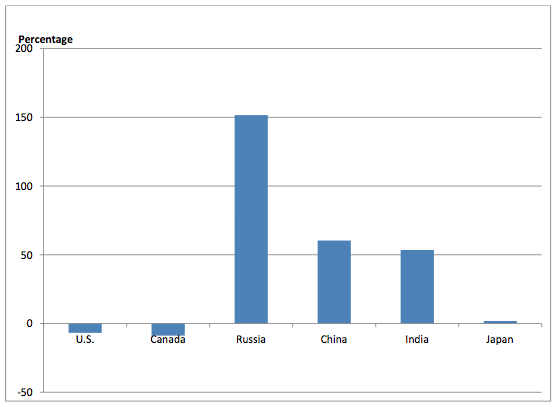 But Japan too would converge by 2011. Using data on BMPH growth rates from the original publication, I calculated the BMPH for 2000 and 2011 in addition to 2007 to get the figures above. This shows the BMPH for 2000, 2007, and 2011 for each major economic region. What’s remarkable is that even in many of the countries lauded as “emerging markets” there was hardly any visible progress, and in a few cases, outright decline. 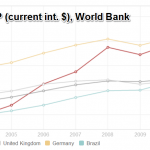 But what’s most fascinating is how Russia, whose economy has never received much in the way of praise, has emerged from Latin American-like destitution in 2000 to perch fairly close to the BMPH of the US, Canada, Japan, and Western Europe by 2011. If that is not an “economic miracle” then I don’t know what is. This convergence is reflected in many other aspects such as Internet penetration (now equal to Greece and Portugal), new car sales (Czech Republic), GDP in PPP terms (Poland). Furthermore, as the MBPH directly reflects the earnings of lower income workers, it implicitly accounts for the relatively high – but by no means exceptional – levels of inequality in Russian incomes. That said, the finding that Russian real incomes (as per the BMPH) are now at about 80% of American and West European levels has to be treated with some caution. After all, the Big Mac is domestically produced, but to buy stuff like quality cars or take foreign holidays you have to pay international prices which are far higher than Russian domestic prices. E.g. only 8% of Russians will vacation abroad in 2012 (5% if you just include the ex-USSR Far Abroad), compared to 20% of Americans. As shown in the graph above, originally compiled by Sergey Zhuravlev, Russian consumption of food products, meat, fish, milk, and fruit is now essentially equal to US and West European levels. (Consumption of tobacco and alcohol is unfortunately significantly higher). But spending on clothing, housing, furniture, healthcare, transport, holidays, and restaurants is below 50% of US levels, even after accounting for price differences. (The situation vis-a-vis Western Europe is slightly better). On the one hand, this means that whereas Russians now have full bellies, the country still lags on life’s perks and luxuries – most especially on restaurants and holidays. On the other hand, it may well presage strong growth in the years to come as Russia during the past decade has laid the base for a rich consumer society.